Patrick McGuigan is a Brighton-based freelance food journalist and cheese writer, who contributes to titles including The Telegraph, The Financial Times, Harrods Magazine and Restaurant, among many others. An experienced editor and engaging writer, Patrick studied journalism at the London College of Printing. His work has taken him to the tea gardens of Darjeeling and the kitchens of Michelin-starred chefs for articles in national newspapers, magazines and restaurant guides. Other titles that have featured his work include Conde Nast Traveller, The Evening Standard, Square Meal, Shortlist, The Spectator, Which? Good Food Guide, and easyJet Traveller. He also works closely with the Guild of Fine Food on various projects. 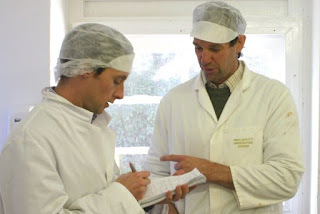 One of the country's leading cheese writers and communicators, Patrick has interviewed many of the world's best cheesemakers, affineurs and mongers, writing extensively on the subject for the Telegraph, among others, and appearing on BBC Radio 4's The Food Programme. He hosts regular talks and tastings for the public, trade and press, and is a senior judge at the World Cheese Awards and the Cheesemonger of the Year award. He also runs training courses at the School of Fine Food and has studied cheese at the School of Artisan Food, the Cheese Guild and the Academy of Cheese. For more curd nerdery, see his blog www.cheesechap.com. Patrick is the co-founder of the London Cheese Project festival and Brighton's Best Restaurants awards, plus the OctoberBEST restaurant festival in Brighton.